It’s hard to believe that it’s been over 3 months since our summer interns Avi, Emely, and Vincent flew the nest and moved on to other exciting adventures. Some of them haven’t flown all that far (you’ll learn more about that in a moment) but all of them have grown by leaps and bounds. I took a moment with them to have an intern update before the tide of finals, holidays, and end-of-quarter rush took over. Jumping into an internship, especially your first, can always be a challenge. You don’t know what to expect, how well your skills will be highlighted, or whether your classes have actually prepared you for the reality that is a full-time job. For Vincent, this was his first experience working in an agile environment. “The process and ideology I’ve picked up during my time will undoubtedly pay dividends in whatever software engineering career I choose,” he said. For Emely, it was less about the technical lessons and more about the process. 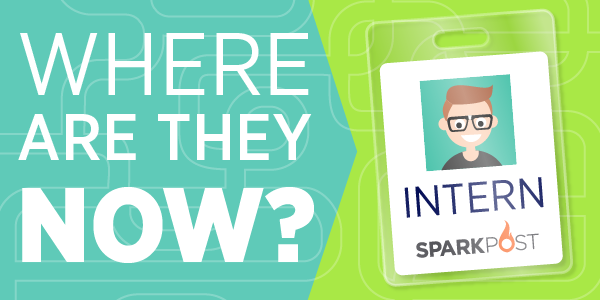 But this summer was about more than just learning the ins and outs of SparkPost. Internships give students the opportunity to interact with a team of engineers as well as people outside of the engineering department. They’re able to make connections with folks across the organization, learning not only the processes, but the personalities. Emely says for her, the internship “opened the door to the developer community” and allowed her to realize her potential. Avi says that the thing he enjoyed the most wasn’t working on the new (beautiful) website, or refactoring the PHP client library, but the interactions with the people on his team. Likewise for Vincent, it was the people that set the job apart. So what are our savvy interns up to now that life has returned to normal? Emely’s back at RIT, plugging along on her Bioinformatics degree, but has also added a minor in Software Engineering. Why add more to her load? Vincent is continuing to pursue his Computer Science degree at the University of Maryland. He’s also balancing out his time with extra-curricular activities. Avi’s fall has been slightly different, as he’s stayed in the Columbia area with us at SparkPost. In short, we’ve been lucky enough to watch these three awesome people grow both as individuals and as programmers. We love having interns for just this reason! You all teach us a lot about ourselves and help us make our product better. Enjoyed this intern update? Join our slack channel and chat with us about it! Interested in working for us? Keep an eye on the careers page! We’ll post summer internships in the new year, but there are many full-time opportunities available now!